Yesterday I ran in my first competition of the Swedish season, Måsenstafetten. 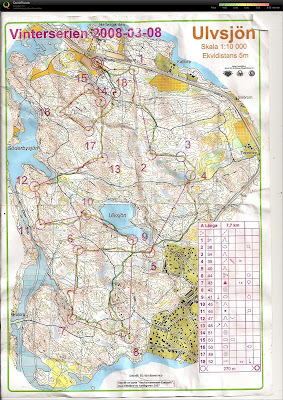 A five man relay competition down near Nyköping, about 90 minutes south of Stockholm. Lidingö decided to field 2 even teams, and there was a mix of good clubs doing the same, but also some with their strongest team. All 5 legs ran about 8km, and after 2 legs my team was doing quite badly, already 8 minutes behind the lead! Legs 3 and 4 ran well though, and I went out on last leg about 2 minutes behind Holmberg in 2nd, 45 seconds behind Emil in 3rd for our other '1st team'. I started 2 seconds before Skogtjärn and 45 seconds before Millinger. I ran well to the first control, and caught Emil who missed a little. Then I had a longer gaffle than him and Skogtjärn to the second. I followed them towards their control then had to go further east to mine, so they were both out of sight on the way to the 3rd (which Emil missed and I got in front). Running across to the 5th control I could see Holmberg and Millinger about 100m in front, so I knew 2nd place was up for grabs! I really stupidly pushed really hard to catch them, and followed them in overshooting the 6th control. I ran within 5m of it, then ran 100m too far, turned round to see Emil punching it and running away. Ran well to the 7th, different route to the other 4 guys, but then to the 8th, 9th and 10th we were all pretty close (with some small gaffling). 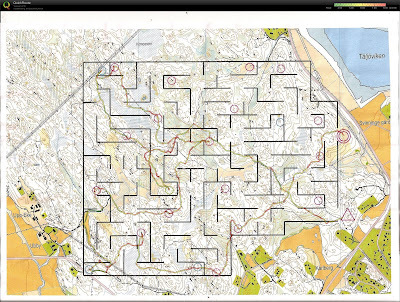 The 10th control was a common radio, and Holmberg took it just before me and Emil. Then he had an extra control and me and Emil ran away up the hill to our 11th. He was running real fast and I struggled to stay in control, so I let him get a small gap. Unfortunately I couldn't close it again! He had a different 13th, and after I plunged into the cold green marsh I didn't see him again. I dropped 10 seconds on the 14th control with a dumbass route, and he was out of sight. All the other boys were out of sight behind so cruised into the finish to take 3rd. Cool the have 2nd and 3rd places for our teams! And our 2 'even' teams only finished 32 seconds apart. It was an awesome relay training to be up against 3 Swedish internationals and one of the best last leg runners in the country pushing on the last leg. I took second fastest time of the day, but 2 minutes behind Peter 'local hero' Öberg! Finally I'm back home after more than 2 months away training in South Africa and England. It's good to be back, even if it means lots of running in the snow. 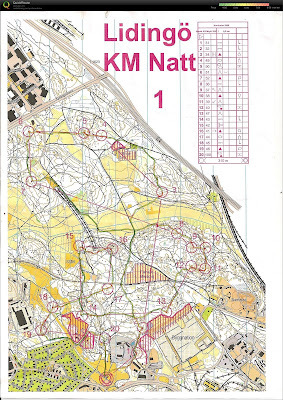 I have got back into some really good technical training (some maps below), and some British juniors came out for a long weekend to get some experience in Scandinavia. As well as some tough orienteering training, we also had time to do some night sledging on the Lidingo ski slope and have a bit of a birthday party. Last week I did an interview for an outdoor gear website, you can read it here. This interesting sounding training was as complicated as it looked. 75 minutes to score as many points as possible, 1 point for a red control, 2 for blue, 3 for green. Double points if you are the first to a control (it was a mass start). Minus 1 point for each time you cross a 'wall', and for every minute late. I was RUBBISH. The map was old and the vegetation was out of date, but that is no excuse. I started really fast and made a huge parallel error trying to be the first to the green control. I crossed about 5 walls on the way there! After that was much better, once I had relocated, and I only touched a wall once by accident and once on purpose on the way back when I was running out of time. Really cool training, but I was pathetically bad! 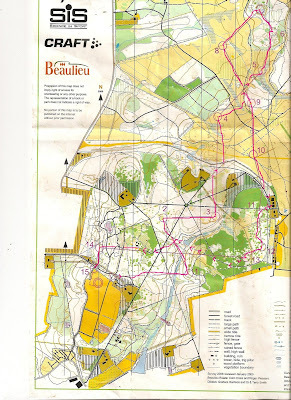 I ran this course from last years club night champs with Jonn Are, nice medium intensity training in quite an urban forest. Today I ran in the Vinterserien race in Nacka - one of my favourite places to run in Stockholm. Really beautiful terrain, pretty nice course. I made one mistake at number 10 - the control was really tucked away and I ran right past it. Apart from that pretty happy. 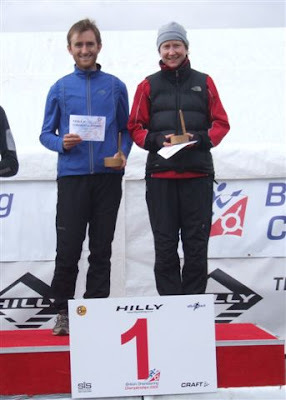 The very early British season continued this weekend with the first elite races of the year. First up was the first UK Cup race, the British equivalent of Eliteseries, including all the top races like the JK and the British Champs, and some stand alone races like this. It also doubled as a junior cup race, so there was some pride at stake there too! 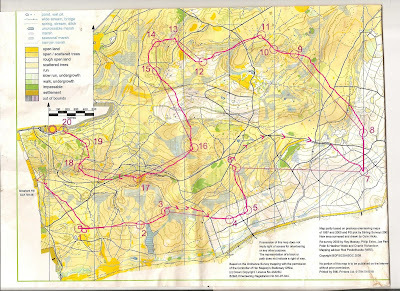 The race was held at Hampton Ridge in the New Forest, which is an absolutely beautiful place, but could never be accused of having the most challenging orienteering terrain. The main challenges were understanding how the gorse bushes were mapped (failed utterly at the first control and lost 1.30), keeping direction across featureless heathland, and working out which of the many small parallel ditches are the one which is marked on the map. I managed to take the victory, but Duncan ran really well until the last part when he was a bit scrappy and let me back in. Great to see the juniors doing so well! 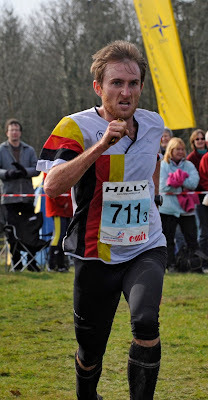 Sunday was the British Relay Championships - the first weekend in March! Bit early for some, and the start list was weaker than previous years. The timing of the race affected my club too, with several of our best runners unable to come. Unfortunately my training mate from when I was back in the UK, Jules Simpson, hasn't been training quite as he used to, but he was doing a decent job on first leg until the technical green area towards the end when he dropped almost 5 minutes! He came back in 15th, 7 minutes behind the rampant favourites, South Yorkshire and Nick Barrable. Matt Halliday, our rising star and junior team member, ran really well to bring us up to 7th place, and in a pack up to fourth place. I started fast, and quickly myself and the South London runner, Ralph Street (another really fast junior!) were running away from the other guys in the pack. We ran at a high speed, and pretty accurately too, and half way we caught the 3rd team (although actually Thames Valley were actually 3rd at that stage, they were ineligible with a foreign runner, Bertuks, in their team). Coming back into the woodland, and the technical green area, I was able to get a gap to Ralph, and caught up with Bertuks at the second last control. Again a tactical tripping over my own feet meant I didn't have to do a sprint finish, although to be honest the effort I put in to catch Bertuks over the last 2km meant I had absolutely nothing in the tank as he sailed up the hill to cross the line. Luckily (for us) they were not allowed to take a prize, so Octavian Droobers took their first relay medal in a couple of years (we won in 2003, and have taken one bronze since then I think, but apart from that it has been a lean couple of years). British Champs bronze to start the year - pretty good! South Yorkshire were run away winners as expected, but it was good to see Sheffield University take second with 3 solid performances. I had the fastest time of the day, and if Jules hadn't made the mistakes at the end, it could have been really interesting to see if I could have caught Baker on the last leg.